Location: Denmark is located in the Northern Europe in a region known as Scandinavia. Denmark is one of the Nordic countries (along with Finland, Iceland, Norway and Sweden). Denmark shares a border with Germany. 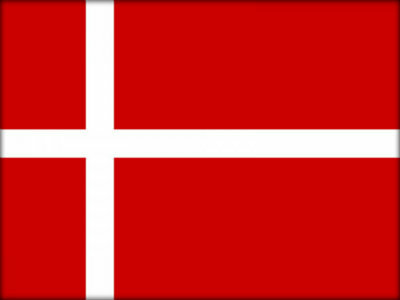 The flag is known as the Dannebrog and versions of it have been used since the 1400s. Denmark’s official title is the Kingdom of Denmark. During the 8th, 9th and 10th centuries, Vikings sailed out from Denmark and raided and settled coastal regions all over Europe. The Danish Vikings were very active along the coast of the British Isles. Denmark is made up of the peninsula of Jutland and more than 440 named islands. The largest of Denmar’s islands are Zealand and Funen. Many of Denmark’s islands are connected by bridges. Denmark has over 7000 km of shoreline. Both Greenland and the Faroe Islands are part of the Kingdom of Denmark, yet they are nearly entirely self-governing. On 9th April 1940, during World War 2, Germany invaded Denmark. Hans Christian Andersen, the famous writer of fairy tales, came form Denmark, as did the physicist, Niels Bohr, and the playwright, Ludvig Holberg. The Danish architect, Jorn Utzon, designed the Sydney Opera House. The beers Carlsberg and Tuborg come from Denmark. Lars Ulrich, the drummer for the band Metallica, was the first Danish musician to enter the Rock and Roll Hall of Fame. Soccer is Denmark’s national sport and Denmark has produced some of the world’s best players over the years, including Peter Schmeichel (goalkeeper), Brian Laudrup and Michael Laudrup. Denmark won the European Championships (soccer) in 1992. Caroline Wozniacki, the former number one women’s tennis player, is Danish. LEGO was invented by Ole Kirk Christensen, a Danish toy-maker, and the LEGO Group is still based in Denmark in a town called Billund. Billund is also the home of the first Legoland theme park, which opened top the public in 1968.